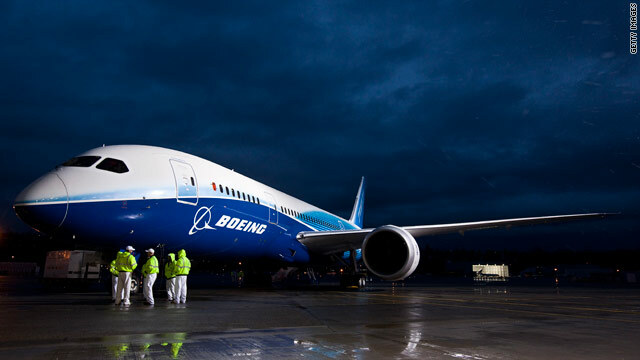 The Boeing 787 after its first flight in Seattle last year. It is claimed to be 20 percent more fuel efficient than its predecessors. London, England (CNN) -- Air travel could be powered from vast seas of algae growing close to airports within four years, according to researchers and airlines hoping to find a green future for aviation. Industry giants including British Airways and Airbus are supporting a project at the UK's Cranfield University to investigate ways of harvesting algae for jet fuel in commercial quantities. The project gets underway as 1,500 delegates from governments and the aviation industry leave Montreal after the triennial conference of the International Civil Aviation Organization, which finished on October 8. Targets to improve fuel efficiency up until 2050 were agreed at the conference, but many believe the organization is moving too slowly. Steven Tebbe, a consultant advising the industry on improving its green credentials, pointed out that the best airlines are improving their fuel efficiency by around 1.5 percent a year, but the aviation industry as a whole is growing by 4 to 5 percent a year. Other measures, including alternative low carbon fuels and economic incentives will be needed make air travel greener, he said. The key to sustainability is not putting all your eggs in one basket. Researchers at Cranfield argue that algae present a better option than other bio fuels because they do not compete with land for food production. The technology already enables biofuels to be used in existing aircraft, but the challenge is to produce them in large enough quantities. Professor Feargal Brennan, of Cranfield University, believes algae could be produced commercially in four years time. He said: "A great advantage of algae is you can harvest it every seven to 12 days, so you get 30 to 50 harvests a year, compared with one a year of conventional crops. "The big problem is getting enough biomass to supply industry without having an adverse affect." The researchers will also look at whether the algae could be grown close to airports to prevent the environmental cost of distributing fuel around the globe. "If you have to employ tankers to bring it around the world, it wouldn't be green," said Brennan. Like most experts, Brennan warns against seeing algae -- or any other single technology -- as a "silver bullet." "The solution to aviation fuel is likely to come from a variety of sources and this is only one of them. If there's one lesson in all forms of renewable energy, it's that there's no silver bullet. The key to sustainability is not putting all your eggs in one basket." British Airways announced earlier this year it was establishing a facility in east London to convert 500,000 tonnes of waste a year into 16 million gallons of jet fuel. The airline said it would use low-carbon fuel to power part of its fleet by 2014. Airlines are taking biofuels seriously. Air Transport Action Group, which represents all sectors of the aviation industry globally, claims biofuels can reduce emissions by up to 80 percent and said five airlines have held test flights in the past 18 months. However, the industry is looking more widely than biofuel to meet its targets to improve fuel efficiency by an average of 1.5 percent a year until 2020; achieve carbon neutral growth from 2020; and halve its emissions by 2050 compared to 2005 levels. Haldene Dodd, of the Air Transport Action Group, said: "We are the only industry in the world with a global agreement to deal with our CO 2 emissions. "Aviation only makes up 2 percent of emissions released by humans every year. We are a small part of a big problem, but we felt it was important to come up with a solution." Dodd said that in addition to biofuels, the industry is producing more efficient aircraft, improving operations, improving infrastructure and accepting economic measures. He said new aircraft currently being brought into service such as the Boeing 787 and Airbus 380 use the same amount of fuel per passenger per 100 km as a hybrid car. Dodd said: "Improving our operations means making sure everything on board is as light as possible, from removing magazines to making the catering trolleys and cutlery from lighter materials to carrying less water. "Improving infrastructure means new air traffic control systems that allow aircraft to fly in straight lines rather than zigzagging through airspace." One controversial aspect is economic measures such as taxes and the Emissions Trading Scheme. The European Union is due to extend its Emissions Trading System to include aviation in 2012, but others have resisted such measures. Bill Hemmings, of Transport and Environment, a pan-European organization campaigning for sustainable transport, argued that much more is needed. "Aviation is the most polluting form of transport, but it pays zero tax," he said. "The EU Emissions Trading System being extended to aviation in 2012 should be extended globally, but even this will only cost 1 cent per liter of fuel." Hemmings said the industry was only just beginning to take its environmental responsibilities seriously. He said: "All the technological advances in aircraft manufacturing in the last 10 years have gone into flying further, faster and heavier." In the longer term, NASA hopes to contribute to the solution with its Environmentally Responsible Aviation Project, researching efficiencies to the design of aircraft to be used from 2020 onwards. Project manager Fayette Collier said: "We have targets to reduce fuel burn by 50 percent, half noise pollution near airports, and reduce nitrogen oxide emissions by 75 percent. "I do believe this industry has taken the challenges head on and we are serious about finding ways to minimize our environmental impact."